This article is about the year 1597. 1597 (MDXCVII) was a common year starting on Wednesday of the Gregorian calendar and a common year starting on Saturday of the Julian calendar, the 1597th year of the Common Era (CE) and Anno Domini (AD) designations, the 597th year of the 2nd millennium, the 97th year of the 16th century, and the 8th year of the 1590s decade. As of the start of 1597, the Gregorian calendar was 10 days ahead of the Julian calendar, which remained in localized use until 1923. Wikimedia Commons has media related to 1597. Andreas Libavius's Alchemia, an early chemistry text, is published. January 24 – Battle of Turnhout: Maurice of Nassau defeats a Spanish force under Jean de Rie of Varas, in the Netherlands. February – Bali is discovered by the Dutch explorer Cornelis Houtman. February 5 – In Nagasaki, Japan, 26 people are martyred by crucifixion. They practiced Catholicism, and were taken captive after all forms of Christianity were outlawed the previous year. February 8 – Sir Anthony Shirley, England's "best-educated pirate", raids Jamaica. March 11 – Amiens is taken by Spanish forces. March 18 – Tycho Brahe's stipend is stopped. March 29 – Tycho Brahe leaves Ven and moves to Copenhagen (Farvergården). April 4 – Christian Friis and Axel Brahe go to Ven to check complaints, and a commission is established to investigate Tycho Brahe's leadership. After April 10 – Serb uprising of 1596–97 ends with defeat of the rebels at the field of Gacko (Gatačko Polje). April 22 – The vicar of Ven is dismissed: he had followed Tycho's orders not to perform an exorcism. April 23 – Probable first performance of William Shakespeare's The Merry Wives of Windsor. April 27 – Johannes Kepler marries Barbara Muhleck. June – Tycho Brahe is not allowed to make observations from The Watermill Tower, and he is not allowed to perform chemical experiments at his house in Farvergade. June 1 – Tycho writes a recommendation supporting Longomontanus, who is planning to study in Germany. June 2 – Tycho leaves Copenhagen and goes to Rostock. June 10 – Tycho is removed from his job working at Epiphany Chapel in Roskilde. June 16 – Tycho flees, and becomes a servant of the king of Spain. c. July – Thomas Nashe and Ben Jonson's satirical play The Isle of Dogs is performed at the Swan Theatre in London; it is immediately suppressed by the authorities and no copy survives. July 10 – Tycho Brahe's famous letter[clarification needed] to King Christian IV is sent from Rostock. July 14 – Scottish poet Alexander Montgomerie is declared an outlaw, after the collapse of a Catholic plot. August 13 – The Siege of Namwon begins. August 14 – First Dutch Expedition to Indonesia: A Dutch expedition commanded by Frederick de Houtman returns to Amsterdam, after having successfully reached the Spice Islands. This achievement opens the Spice trade, which had until then been monopolised by the Portuguese, to the Dutch, who in the next years launch several more expeditions to the Indies. August 17 – Islands Voyage: Robert Devereux, 2nd Earl of Essex, and Sir Walter Raleigh set sail on an expedition to the Azores. August 19 – Rheinberg capitulates to forces led by Maurice of Naussau. August 24 – Christian IV of Denmark refuses to let Tycho Brahe return to Denmark. 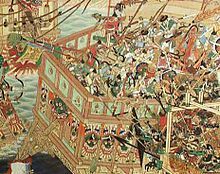 August 28 – Imjin War: Battle of Chilcheollyang – The Japanese fleet defeats the Koreans, in their only naval victory of the war. September – Tycho Brahe leaves Rostock, where plague is spreading, and travels to Wandsbæk. September 25 – Amiens is retaken from the Spanish by Anglo-French forces, led by Henry IV of France, after a four-month siege. October – John Gerard, a Jesuit priest, escapes from the Tower of London. October/November – The 3rd Spanish Armada is dispersed by a storm; a number of Spanish ships are captured off the coasts of Wales, Cornwall and Devon. October 20 – Tycho starts new observations in Wandsbæk, where he writes his famous elegy. October 26 – Battle of Myeongnyang: The Koreans, commanded by Yi Sunsin, are victorious over a Japanese invasion fleet. November 12 – Lingen capitulates to forces led by Maurice of Nassau. December 15 – Johannes Kepler writes a letter to Tycho about his book, Mysterium Cosmographicum. December 31 – Tycho writes his preface to the Emperor Rudolf II in his book, Mecanica. Abbas I ends the Uzbek raids on his lands. Yaqob succeeds his father Sarsa Dengel, as Emperor of Ethiopia at the age of 7. Jacopo Peri writes Dafne, now recognised as the first opera. The first edition of Francis Bacon's Essays is published. Andreas Libavius publishes Alchemia, a pioneering chemistry textbook. 12 million pesos of silver cross the Pacific. Although it is unknown just how much silver flowed from the Spanish base of Manila in the Philippines to the Ming Dynasty of China, it is known that the main port for the Mexican silver trade—Acapulco—shipped out 150,000 to 345,000 kg (4 to 9 million taels) of silver annually from this year to 1602. Tobias Hess corresponds with Simon Studion and agrees with him that the Papacy must fall in 1604. ^ "Historical Events for Year 1597 | OnThisDay.com". Historyorb.com. Retrieved 2018-04-05. ^ "From liquid to vapor and back: origins". Special Collections Department. University of Delaware Library. Retrieved March 12, 2007.